Tools to optimize Google Reader. As most of you are aware Google Reader is an excellent tool to subscribe to news feeds. And along with a new and popular tool one can always expect third party add ons. And that is beauty of the Internet. Just when you start to fall in love with a tool these adds can make you fall head over heels in love with an amazing tool. And as it was inevitable several add ons have popped up that will make your experience with Google Reader a more rewarding one. Google Reader Notifier (For Mac OS X Tiger users): Google Reader Notifier is a private open source project utilizing the unofficial Google Reader API, and is not related to Google. This tool displays the unread items of your Google Reader account right from the menubar of Mac OS X Tiger. This keeps track of new items within your entire reading list or just for a particular tag. Godita: This tool is a Google Reader Del.icio.us Tagging bookmarklet. This tool lets you copy Reader items that interest you to del.icio.us, along with all the other items you've bookmarked over the Web. Google Reader Optimized: This is a tool that optimizes the Reader taking away all the unnecessary UI elements. It's a skin that can be applied using either the Stylish user styles Firefox Add-On, or the Greasemonkey Add-On. This set of user styles maximizes the reading area. Using your cell phone to Control Google Reader (Mac users): Romeo is a tool that is available for free which allows the user to control their MAC remotely using a blue tooth and a compatible mobile device. It lets you control your iTunes and DVD Player, as well as presentation applications. Now Ben Wong has come up with a Google Reader Romeo Script that lets you control your Google Reader using a blue tooth enabled mobile device. 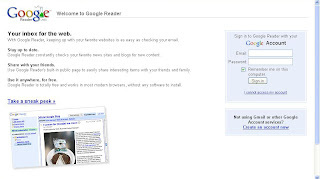 Google Reader button for Internet Explorer 7: This a button that integrates with the Google Tool bar for Internet Explorer 7 and notifies the user about new items through an icon that offers a color change (green) to notify a user of new content. And finally, for those who are not yet aware of the Google Reader keyboard short cuts, take a look here. The Official Google Reader blog.